Status: offline Mission objective is to brush aside expected enemy forces, ideally weakened by initial bombardments, and enstablish a foothold over the Brend river, including the Bad Neustadt town. My starting forces are just recon elements, supported by a T-80U battalion. No infantry whatsoever, no AA cover, no artillery support. Reinforcements will arrive not-so-shortly: AA in 10-15m, tanks in 35m, infantry in 50m, artillery in 60-65m, air support in 69m. I learned in the "Eyes, Ears, Teeth" scenario that if properly positioned even light forces can hold their ground against NATO assaults, but only if i manage to get into cover fast. Enemy forces, however, seems to be numerous and of high quality. I hope my T-80s manage to hold the line for a hour or so. It's really simple: if i don't manage to place myself in some nice easily defensible spot, and the enemy does it first, it's unlikely my reinforcements will be able to dislodge them. So, I plan to run at full mast to the objective and set up some urban and reverse-slope defense, so I can try to engage enemy Bradleys and Abrams at very close range. There are a couple hexes I can use for this, so i'll try a Hasty Move toward them. My forces spring forward, but the enemy has been fast too: a Bradley platoon takes a VP in Bad Neustadt and fires at my recon elements, fortunately without effect. Bradleys are armed with deadly ATGMs so they are dangerous to my tanks. They took a VP, fired a salvo and vanished in the town, so I decide to risk and don't stop my advance. My recon elements keep advancing, and the Bradleys counterattacks: a BDRM-2 unit of three is destroyed, and my tanks advance without firing at close range; even before i have time to panic, a BDRM-2 recon unit armed with AT-5 Spandrel fires on the enemy, and destroys 4 enemy IFVs! It's a monumental success, and surely i didn't expect it! 4 Bradleys destroyed at the expense of 3 light BDRM is a magnific trade-off! Meanwhile, i have occupied the bridgeheads i wanted, and i'm in a fairly strong position in the town. AA elements have arrived and are rushing forward to occupy elevated points and cover my forces. 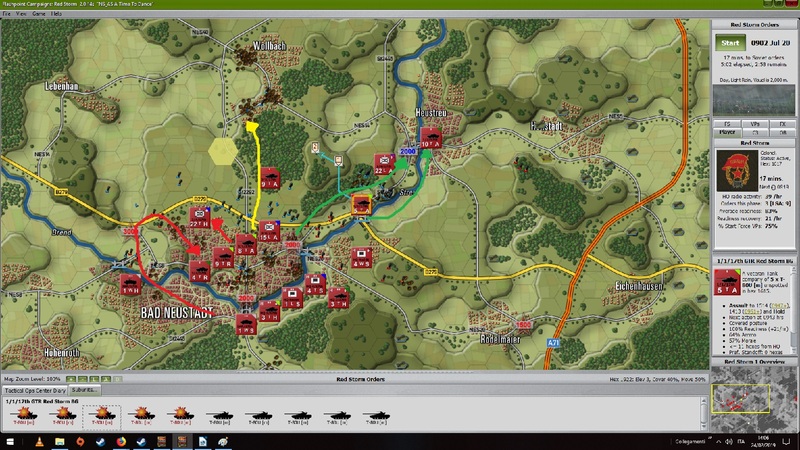 There are 5 M1A1(HA) tanks rolling toward Bad Neustadt from the north; i have the northward route covered by the Spandrels, and the outskirts are in my tanks' sights. I think if the enemy rushes forward i can ambush and demolish them. Great AAR! Thanks for posting. NATO troops decide to take me head-on at close range. Bad move. A recon HMMW unit attacks the easternmost bridgehead and is swiftly destroyed by T-80s. Enemy Abrams strike at the central bridgehead and while eliminating 2 BDRM-2, 1 T-80 and 2 Spandrel BDRMs, they are all destroyed in the shootout. A BTR-60 that accompanies the recon battalion HQ is destroyed too. Overall, for now, the battle is going heavily in my favor, and the first reinforcements arrive: a full tank battalion, that i decide to rush forward and split up among the bridgeheads. Later, the mechanized infantry battalion arrives too. NATO tanks roll forward once more, but it's a massacre: my dug-in T-80s start shelling them and destroy 2 of them as soon as they reach clear ground; others are destroyed at various ranges (1500 to 500m) by the deadly Spandrels. I didn't expect them to be THAT effective! Artillery arrives too, and since i (maybe) just located an HQ, i order them to fire at will at its presumed location. When the barrage goes down, i see 2 HQ exploding, and after that NATO command cycles jumps from 13 to 21m, so i probably killed their main HQ. NATO assaults go on, but i manage to hold the ground and inflict more casualities than the losses I take. My SP-SAM unit is hit by mortar fire and lose a vehicle, then gets destroyed by Bradleys at long range. My tunguskas, on the other hand, have encountered obstacles and aren't in position yet. I hope enemy helicopters don't arrive too soon. 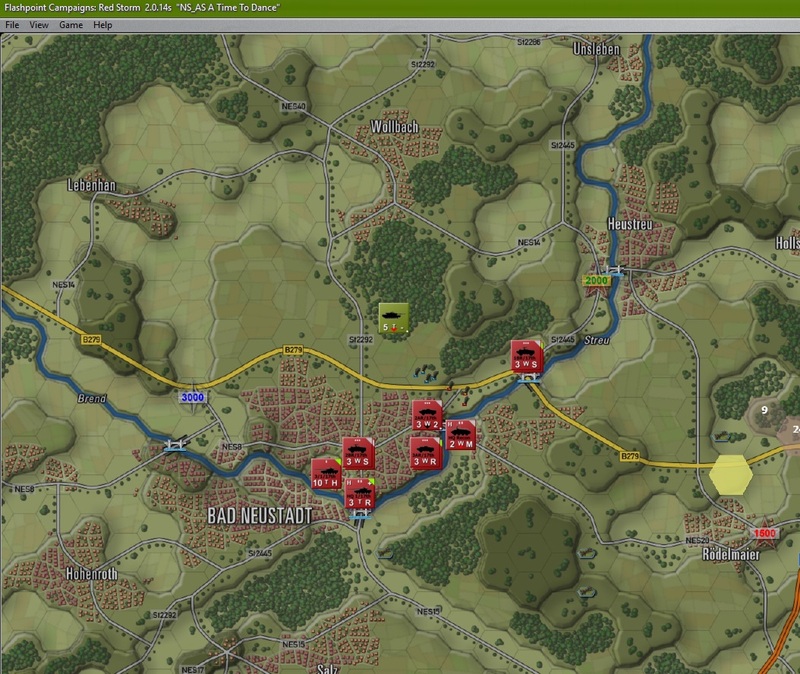 An elusive Bradley unit (or two) dances around the outskirts of Bad Neustadt, plinking at my forces downtown. Others charge down the main road and, togather with mortar fire, decimate my BDRM-2 Spandrel. I decide to withdraw my BDRMs and let the T-80 deal with the assaults until my reinforcements arrive. Half an hour later, my carefully positioned Tunguska finally arrive in position... and get blown up by an Abrams platoon on the other side of the river. My AA is gone. At least, i find another HQ and shell it, destroying 2 APCs. My MiG-23s arrive and destroy a Bradley. Enemy artillery takes out a T-80. Overall, i'm holding the line. The enemy is elusive, but to take the bridgeheads he has to get up close and personal with my dug-in T-80s and it's not pretty for them. At 6:50, NATO hits the 70% losses threshold and i'm able to claim a decisive victory with all the VP reassigned to me. Given that my reinforcements has just arrived (claiming 4 Abrams in a decisive encounter at the easternmost bridgehead) i'm not inclined to let NATO get away. I want to break out of the bridgeheads and annihilate the rest of the NATO units that keep firing on my units from out of town (Bradleys firing at me through 1000m of urban hexes...). I order all units on the front to slowly advance and occupy the outskirts of the town in order to engage the unknown NATO units that fires at us from outside Bad Neustadt. A company of T-80U is ordered to drive west and occupy the westernmost VP just behind the bridge. The engagements are brutal: NATO mech infantry fights for the outskirts but is driven off despite an Abrams platoon supports them from the clear grounds north of the town. The flanking move of the T-80U company takes a full mech company by surprise and wipes out one of its mechanized platoons on Bradleys. The same T-80Us advance and engage the Abrams, taking them by surprise and destroying them with gun-launched ATGMs. The subsequent offensive, however, is met with a barrage of TOW ATGMs from other NATO units in the northwest. I have then to withdraw my tanks to avoid further losses and reorganize them. Mech infantry is ordered to take up position to cover the retreat, and artillery is instructed to strike the presumed enemy positions. With only an hour or so of time remaining, and no further sightings of enemy units, i decide to make a sortie to mop up any NATO unit still in the area. A couple towns surrounding Bad Neustadt are taken, and just as battle time runs off i had found and engaged some enemy stragglers. 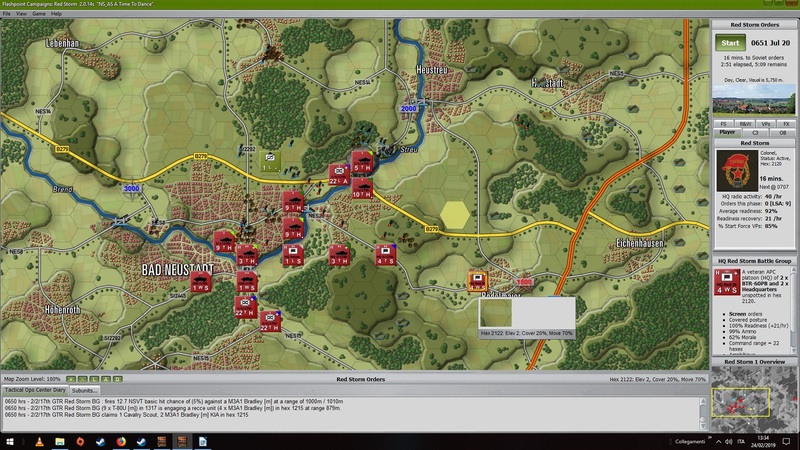 The battle ends with a decisive victory for Warsaw Pact: almost all enemy units have been destroyed, a single VP not taken by me (because i didn't see it lol), and my troops have enstablished a well-defended and reasonably extended bridgehead over the river. One more time, speed and carefully positioning helped WP forces a lot. 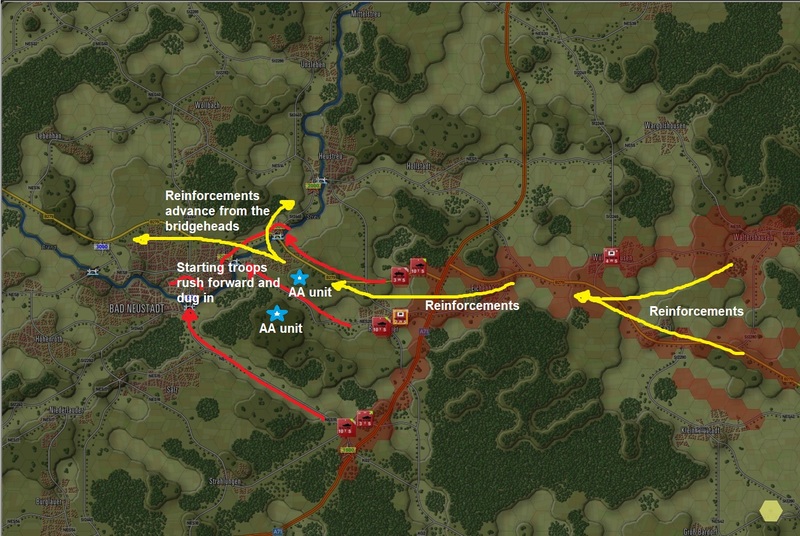 Taking up favourable positions, dug in and fire at close range is the to-go strategy for WP. NATO units, no matter how strong, have it very rough in this kind of battle, because superior numbers and sheer firepower negate their accuracy and spotting advantage. Several times, however, i found my units being fired upon from outside the town. And once more no counter-battery fire has been made by my artillery (maybe because enemy units were out of their range). Direct Support order didn't work as intended too, but that's hardly my Akatsya's fault: it's just that the enemy usually took losses during the initial firefight and pulled back before my artillery could strike them. Taking out the NATO HQ, and doing it again later with the "new" HQ disrupted their command cycle, and this is good. However, NATO seems to be able to reduce its command cycle back to "normal" in about an hour or so. Status: offline Well done. I'm very impressed by your style. Status: offline What you mean? My tactics or my tooootally awesome MSPaint-modified maps? Status: online I do have a question, which scenario version was that? NS or WS? If it was NS, try the WS version as the Soviets. I believe a number of those bridges are blown near the town in that one at start. Status: offline I don't remember, i didn't even notice there were two versions. I'm playing small scenarios before trying bigger ones. Will try the other version. Status: online Just saw the scenario name in one of the screen shots. It is the NATO start scenario. The first letter in the prefix codes indicates player side. N-Play as NATO, W-Play as Pact, H-for head to head. Kind of a pain, but at the time it was the only way to set one side up and leave the other for the player to setup. That will be changing in Southern Storm. The second letter in the prefix is size. S = Small, M = Medium, and L for Large. Status: offline Nice to know! I imagine the balance of a given scenario varies from side to side to make more of a challenge, right? THat's why in the WP version there are blown-up bridges to slow WP's "run and grab", right? Status: offline aargh - Oh No. I've just spent several hours getting a crushing victory only to realise I've made the rooky error of playing as WP on a Nato scenario. Good victory though - 78/79 US units destroyed, all objectives gained. Status: offline Yep. Now I've loaded it properly from the WP side I see almost every bloody bridge is blown. Well stuff that for a game of soldiers. Status: online Yep, having to recon and setup a crossing or two does slow down the Soviet steamroller. 79 out of 79 US units eliminated. I crossed the river at the far north and far south. There's nothing like an early victory to help you like a game. Question: Is the AI dynamic - i.e. will OPFOR be in different places next time or have I sort of blown it for surprises until my brain fades? Status: online The AI is dynamic in response to what it sees, but starts in the same setup zones. I've probably played the scenario a few hundred times and there is always something that is different in the outcome. A few outcomes with some crazy emergent behaviors that leave you shaking your head. Now, one thing we are looking at for Southern Storm, is some dynamics in the OpFor setups to add even more replay ability to the system. Status: offline Thanks for the reply. You've got a new customer for Southern Storm. I would post a picture of my glorious beginner victory if I knew how to.